It appears all four hands that will be involved in the next UFC light heavyweight title fight have fully healed. The world’s largest MMA promotion announced Wednesday that champion Jon Jones and Quinton “Rampage” Jackson have verbally committed to headlining UFC 135 on September 24th. Rampage revealed he had a fractured left hand after his UFC 130 victory over Matt Hamill, while Jones is on the mend from a hand injury of his own. “Bones” was slated to defend his throne against friend-turned-foe Rashad Evans before his right paw started acting up. UFC president Dana White confirmed the ‘Jones vs. Rampage’ shootout last weekend. However, White said Jones’ hand, not Rampage’s, still needed to be cleared by a physician before things became official. It appears all doctor’s notices have been submitted. Rampage bumped his professional record to 32-8 following last month’s unanimous decision win. The former light heavyweight champ has rattled off two straight victories since dropping a unanimous decision loss to the aforementioned Evans at UFC 114. 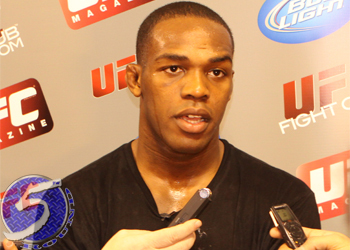 Jones owns a practically perfect 13-1 record, demolishing nearly every 205-pounder that has dared to cross his path. The 23-year-old was last seen taking Mauricio “Shogun” Rua’s title at UFC 128. UFC 135 is expected to take place inside the Pepsi Center in Denver, Colorado.